The professional organization, Staged Homes trains real estate professionals and other interested individuals in the art of "Home Staging" and issues a certificate as an "Accredited Staging Professional ™." Just what do "Home Stagers" do and how can their theory help you sell your home? Get out the cleaning supplies, boxes, and get ready to sell your home fast! You'll love how easy it is to transform a languishing, slow-moving home into a quick sale with just a bit of elbow grease and an eye for beauty. You may be lucky and just need to do some long-neglected simple home repairs, get rid of clutter and add fresh flowers. Or you might have to repaint or recarpet your home to give it a fresh look. If you're handy, you'll be able to do most things yourself. 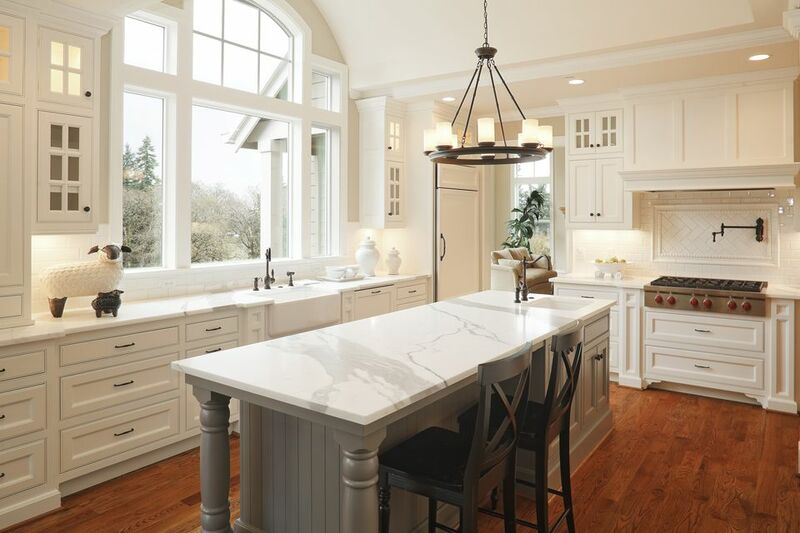 But you may need to hire a plumber to install a new faucet in the kitchen or other professional to replace outdated light fixtures or window treatments. You need to keep in mind that you're not going to make the changes to live in your home. Your only goal is to show your home at its very best to potential buyers. Without being distracted by clutter and dirt, they'll be able to picture themselves in the home you're trying to sell. They will find it hard to resist making an offer. If you're skeptical about the benefits of going to all this work or doubt that it will make any difference in selling your home, put yourself in the place of a home buyer. Have you ever toured through a development of model homes? The paint is fresh, appliances are shiny, there is artwork arranged around the house, and fresh flowers stand on the kitchen counter. Mirrors are sparkling, towels fresh, and there are no toys on the floor. The rooms look spacious and the furniture comfortable. The kitchens and bathrooms are polished, smelling fresh, and clutter is not to be seen. The closets are empty or organized. The garage floor is clean and neat and looks much larger than you'd need for two cars. Now leave the development of models and go down the street where the homes are several years old. Children's toys are stacked in the family room. So many boxes are piled in the garage that you couldn't park even one car there. Clothes fill the bedroom closets and boots and mittens fill the hall closet. The house isn't dirty, but there are dishes in the kitchen sink and toothpaste stuck on the bathroom vanity. Homework is spread out on the dining room table. The family dog is yapping because of the strangers in the house and the floors are scratched. Dead plants "welcome" you at the front door. With all other things being equal, which house would be more appealing to you? Of course, the first one! The homes may be the same size, but because of the clear layout, the first home seemed much larger. The house was prepared to show off all the good points and none of the bad. Lori Matzke, Professional Home Stager and Founder of "Center Stage Home" says, "What most homeowners need to understand, is that the way a home should be presented for resale and the way you live in your home is two completely different things. Most of us don't actually live in our lives like a page torn out of House Beautiful. "Keep in mind that what you are selling is the house -- not its contents," she adds. If you remove throw or area rugs, eliminate clutter and collections, and cut down on furniture and accessories, the room will appear to be more airy and spacious. "It's all about flow. The eye should move easily from room to room, reflecting on the best features of your home rather than on the possessions inside the home. You really have to completely detach yourself from your possessions and look at your home like you're seeing it for the first time." Look through the eyes of the buyer. If you just can't see through all your things to the core of your home, consider hiring a professional. Interview two or three home stagers at your home. Find out what they will (and won't) do, how long it might take, what the fees are, and how soon they might be able to start. Ask for references from recent customers, see photos of their "before" and "after" homes, and get their opinion on what exactly needs to be done in your home. Also, be sure to clarify what items in the plan that you will be responsible for (perhaps moving clutter to the storage unit) vs. what they will handle for you. "Often, a Professional Home Stager can advise you about small improvements that will improve your home's resale value," says Ms. Matzke. "Often times, things a homeowner may overlook, like adding fresh paint and replacing worn carpeting, can make a huge impact on a buyer's first impression of your home. And likewise, what a seller feels may be a big drawback may not be a factor at all in the overall appeal of the home." Ms. Matzke offers more information and a printable list of home staging tips on her website, Center Stage Home. If you're a homeowner with an objective point of view, you may be able to clear out and rearrange by yourself. After all, you'll eventually be packing up all of your possessions to move, so boxing up unneeded items and clutter shouldn't be too much of a problem. However, if you find it hard to edit your own stuff, then either ask a friend to help or hire a professional home stager. You can locate a professional home stager "much like you would find any other professional service," says Ms. Matzke. Ask around and get referrals. Check with your real estate agent. Many real estate firms keep lists of professionals who can do everything from clean a home to repair a leaking kitchen faucet and will probably have information on home stagers in your area as well. Professional home stagers or interior redesigners charge by the scope of the work, anywhere from a few hundred dollars for one room to a few thousand dollars for an entire home. It will depend on the size and scale of the work involved. Most will empty one room at a time then begin to bring back your furnishings and accessories to make a more cohesive design statement. If you decide to do the work yourself, approach the job the same way. Home staging is home staging, no matter who does it. Plan to do one room at a time. Remove anything and everything that is personal, shabby, soiled, or crowded. Clean all surfaces thoroughly, then replace only the pieces that look wonderful. In this case, less is more. Rent a storage unit or borrow a friend's garage for a few weeks or months and fill it with boxes of collectibles as well as sports equipment, holiday decorations, seasonal clothing, and extra furniture. Then begin to fill it with things that are unsightly. Add prepacked items, boxes of garage clutter, and items pulled from storage areas including the basement and attic. You're going to have to move it sometime anyway, so get some of it out of the way before you begin showing your home. You know that people will open your cupboards and closets. Be sure they're organized neatly and not packed to the point of overflow. They'll look more spacious if you don't try to show off your whole wardrobe or collection of china. They're not buying that! Let potential buyers envision their own thing there. Will they fit, or will the space seem too small, since your own things don't fit? If your closets are stuffed, it's time to weed through things. You can either sell or give items away or pack them up for your next home. Every storage area in your home -- including display shelves -- should be neat, clean, organized, and clutter-free. Take down your wedding photos, religious items, the kids' school pictures, and your collection of refrigerator art. A buyer needs to picture himself living in the house. That will be more difficult if your personal photos, awards, and mementos are evident everywhere. It won't take long to remove these things. Be sure to wrap them carefully and put them in the storage unit. During the time of your home sale, you'll have lots of people coming through, including potential buyers, groups of realtors on walk-throughs, open houses, inspectors, cleaners, and handymen. Before they do, pack up your art collections, crystal, silver, and anything that could be stolen or broken. You'll be moving it anyway, so you might as well get it ready ahead of time. Most buyers hire a third-party inspector to check out the systems of the house prior to purchase. Ask for a copy of a home inspection report to learn what areas of a home will be examined before the sale. Whenever possible, repair items that could be cited in the report. You'll probably not be able to anticipate every inspection item, but you'll have another chance to fix these later after the report comes back. You might have lived with gray tile grout or moldy caulk around the tub. But these items may turn off a potential home buyer. Take a good look at your kitchen and bathroom tile. Clean and bleach white grout to remove any stains. Scrape out and regrout any badly damaged or mildewed areas. Caulk corners, cracks, and gaps around the sink and tub. Once the clutter is out of the way, you can really get to some thorough cleaning. Cleaning for home staging goes beyond a regular house cleaning routine. You'll want to really concentrate on bringing a sheen to every surface of your home. Make a list and do the work yourself or hire a cleaning crew to come in after you've moved out the clutter -- and just before your home goes on the market. Check every surface including windows (inside and out) and window sills, ledges, door knobs, ceiling fan blades, mini blinds, ceiling, and floor corners -- and make sure they are clean. It might be helpful to make a list of things to be done in every room. Check off the items as you complete them. Remember the outside of your house when you're getting ready for sellers. After they see your home from the street, they'll notice the front door and porch. Spend some time and money getting this area beautiful. Wash, scrub or repaint the front door so that it shines. Replace the door handle if it is weathered and unsightly. Clean any windows in this area until they sparkle. Add a fresh topiary or planter and keep it watered and trimmed. Put a pretty wreath on the door. Stand outside and look into your entry area. It will be the first thing buyer's see of the inside of your home. Is it welcoming, clean, uncluttered? Remember that the purpose of this preparation is to sell your home fast. What worked for your family may not work for an open house. You may need to call in help from friends or a pro to help you rearrange the furniture for a smooth traffic flow and maximum impact. Rethink your accessories in every room. Keep in mind -- uncluttered, elegant, color-coordinated, beautiful. Again, less is more, so pare down and box up anything "extra" or unneeded. Look carefully at your houseplants. If they're leggy, dying, or otherwise scraggly, it's time to give them a new home or toss them out. Start over with some new plants. There are some services in larger cities that will rent houseplants, so that may be an alternative to buying everything new. Be sure to place the plants in clean and attractive containers that will contain and reduce any problems from excess watering. Dark areas are uninviting, so keep the lights on. Some quick fixes might include opening the blinds, adding lamps, increasing bulb size, or replacing dated light fixtures. You might consider buying several inexpensive uplights. Placed them in corners, on top of a tall armoire, or behind plants to create an interesting layer of light. Clean and neat is obvious. But also consider replacing torn and frayed old towels with a couple of fresh new ones. Put a flowering plant on the vanity, and remove all personal care items from the countertops. Put the dirty laundry somewhere else (perhaps in the washer). Polish the mirror until it glows. If you have room a small table lamp can give a warm glow to this room. Don't undermine your hard work by ignoring basic maintenance during the weeks your home is being shown. Keep up on watering the plants, polishing the mirrors, dusting the front door, and keeping clutter at bay. I know that my pets are part of my family, but prospective buyers may not be quite so attracted to them. If you can, take your pets and their paraphernalia to a neighbor's or a relative's home when showing your house. If that's not possible, put them outside or in a closed room. Many realtors suggest baking bread or cookies to fill a home with a wonderful aroma. Practically speaking this may not be possible every day, but you might keep it in mind for open houses or repeat visits by potential buyers. Or buy some potpourri and refresher oil in a non-offending fragrance like cinnamon or vanilla. If you have a clear floor plan of your home (perhaps from your builder) include it on the back of your home information sheet. It will help refresh the memory of buyers and help set your home apart from all the others they've seen. The plan should be professionally drawn, including room measurements. Get out your prettiest china and centerpiece and create a beautiful table setting. You'll provide a homey look to even the coolest dining room. Set up a tea service at a small table by a window overlooking a garden. Place an open book and cozy throw on the upholstered chair in your bedroom. Pile an attractive bowl with fresh fruit on the kitchen island. Display a vase of fresh (very fresh) flowers in the entry hall. Arrange some beautiful cookbooks on the desk in your kitchen. In short, have some fun with a few accessories here and there, making interesting little vignettes that say " Welcome ". They could very well help sell your home in record time and for a higher price!